Today I am sharing my favorite Charlie Brown Christmas tree. Whew, WOW, it’s that time of year already that we are primping, shopping, baking and trying to beat the rush of the mad season ahead. I love our new Charlie Brown Christmas tree. At least, that is what the boys called it. I have to say though, they like it, and they like that I could have it in the family room and not clutter the space or distract the TV most importantly. I have been wanting one of these Charlie brown scrawny looking trees forever. This year, I decided Merry Christmas to me. You know I have a bad shoulder, if you follow me on facebook you know the troubles I am having. I can’t over do it, and quite frankly no one else around here is going to do the Christmas decorating so I have to make it simple. 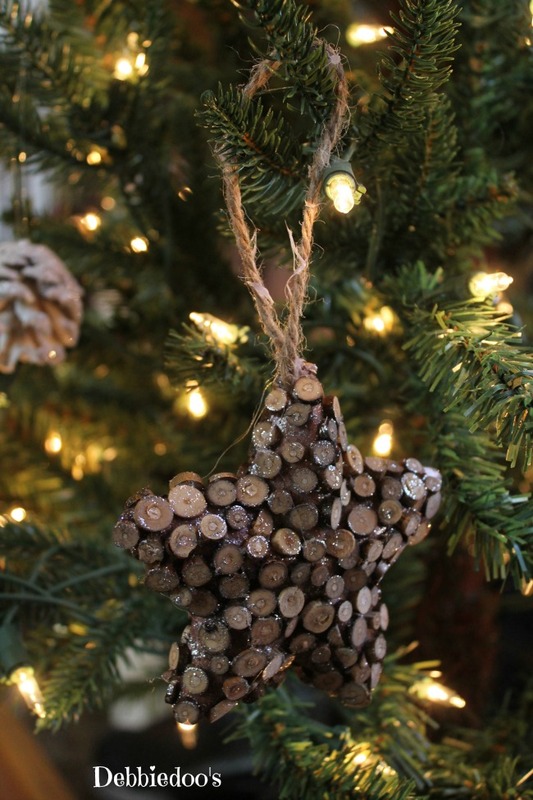 This is the tree from Target with a burlap base, and pre-lit. It stands about 6ft. tall. Target also had some of the cutest little rustic, vintage looking ornaments and I had to toss a few of those in while I was at it. It was a good Christmas present to myself. I made it so much easier on my husband this year. 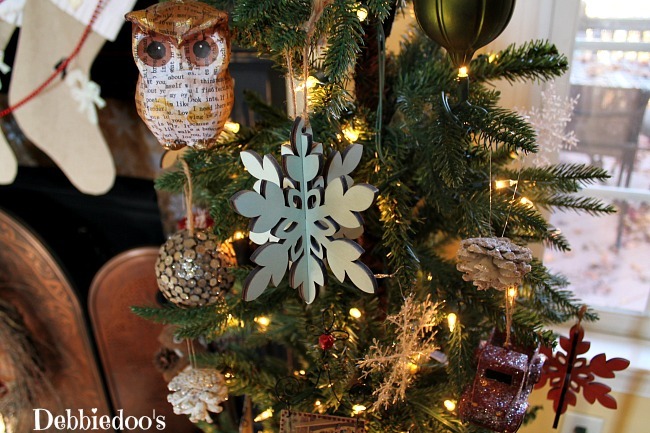 wooden snowflakes in multiple colors. an Owl that appears to be mod podged with some cute paper. 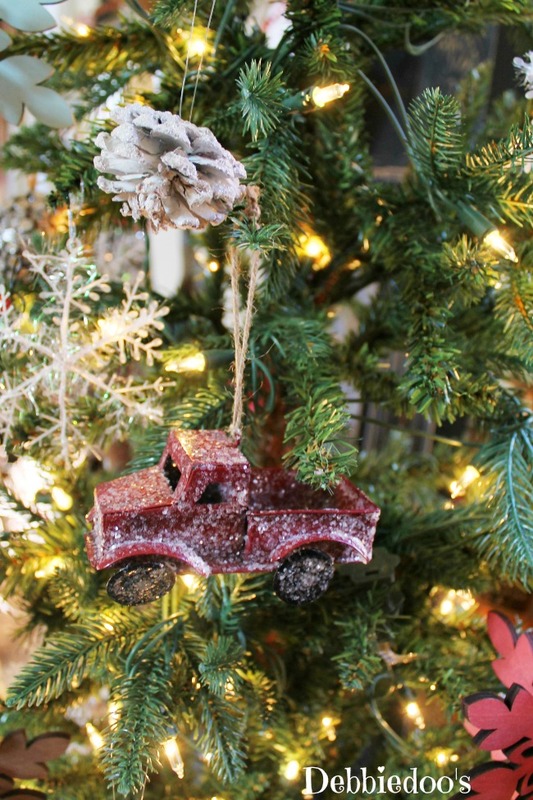 ornaments I had bought from last year’s Southern living Christmas show. and I guess this is a pig snowman…not sure but it is cute! 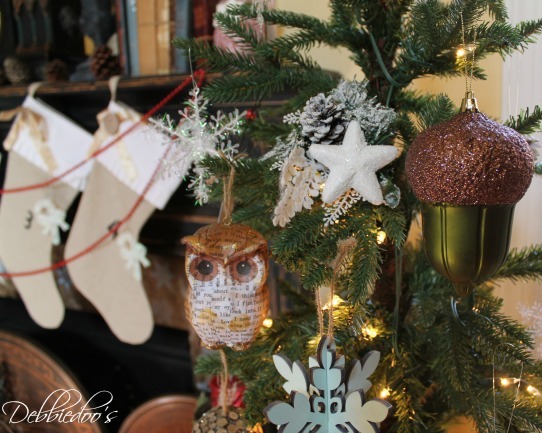 Christmas tree last year decorated with Green mesh, with a whimsical vintage vibe. I have to say, this was so much easier this year. Next up the mantel soon. I am trying my darndest to get my decor and crafts out to you for ideas. There just is not enough time in the day, or month I should say, it’s all going by too fast. Debbie, I love your cute Charlie Brown tree. Wouldn’t mine one of those myself. I have got to go to Target. I have seen so many cute ornaments from there. Not that I need anymore. I am getting rid of boxes of them and then I want new ones. Go figure. Hope your shoulder gets better soon. Oh I love that and it looks so real!! I’m glad to know where you can buy a faux one to share with others. You know I love the Charlie Brown look since that’s all we have this year:-) So pretty and unique!! Thanks for the heads up Debbie! Your tree looks fantastic! Alas, Target is sold out of these almost everywhere. (Yes, I was willing to drive from VA to NC but hubby convinced me I was crazy!!!) I sure hope they bring them back next year! I love your tree! We are thinking about getting a faux tree next year. We have always had a real tree, but I am getting too ancient to be laying on the floor trying to fill the water basin every day! I love your tree Debbie, I always pick the Charlie Brown tree in nature and my kids just give me the eye roll. I think they are unique and special. How cute is this?I want one..love the decorations on it. 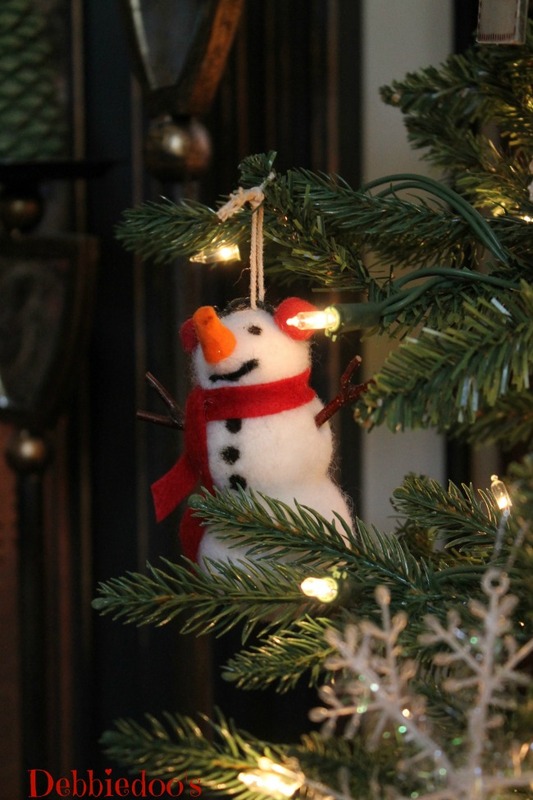 I have always loved a Charlie Brown Tree…Thanks Debbie. 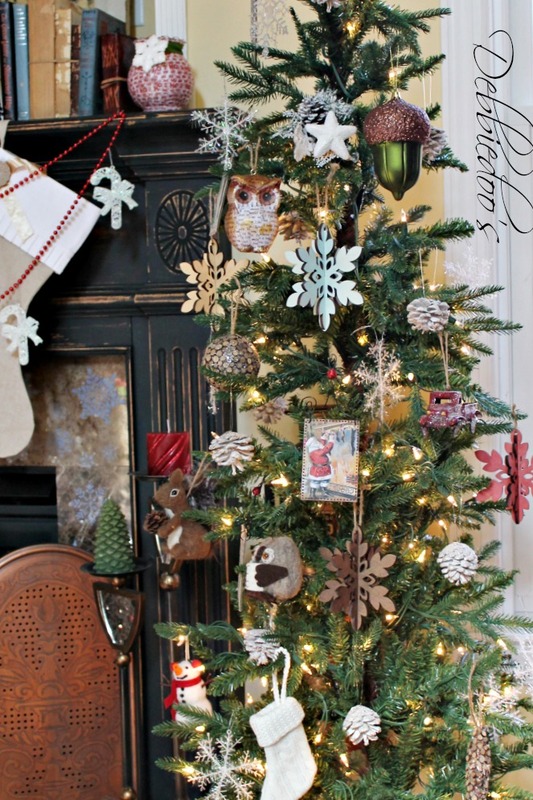 The FB post worked for me and I’m so adoring your Charlie Brown tree….it’s adorbs! he he And I’m trying to fit in all of my posts for the Holidays, too, some might just have to be winter ones! I love that tree. It looks great. I was just looking at Trees last night with my daughter at Target and we saw that one. It is a pretty one. Hope your shoulder starts to feel better. That can hinder life when dealing with that. 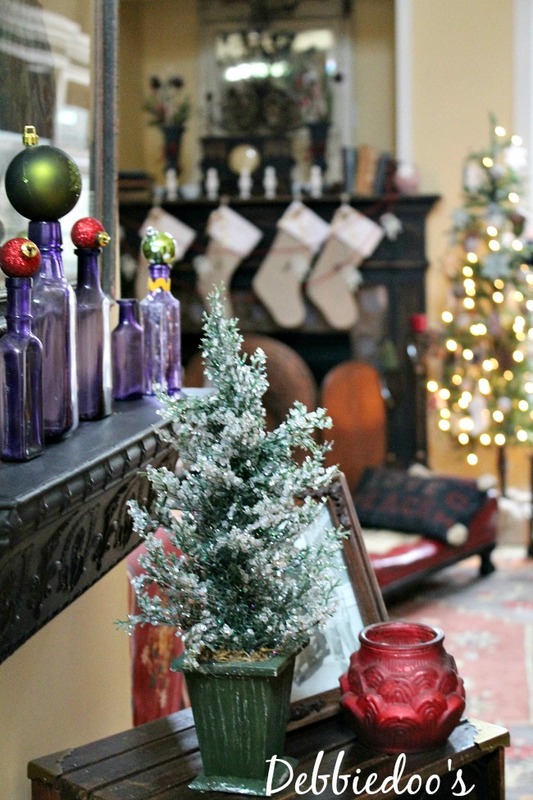 Enjoy decorating the mantel. I know it will look beautiful. I agree, Debbie, it’s going fast! I haven’t got all of my decor up yet…don’t know if I will. Adorable little charlie brown tree. Debbie, love this tree and that green acorn is beautiful. Send it my way!!! I find it interesting that you have a bad shoulder, I – a knee – and that we both posted about simpler decorating on the same day. And all is good with that. Just don’t anyone ask you to reach for something or me to get up and fetch it! I love it Debbie! 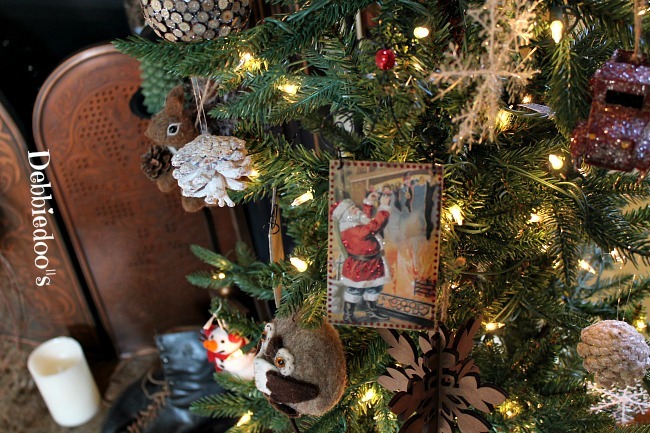 The ornaments are just adorable and I love how well it all looks in your room…it’s just perfect! Debbie!! 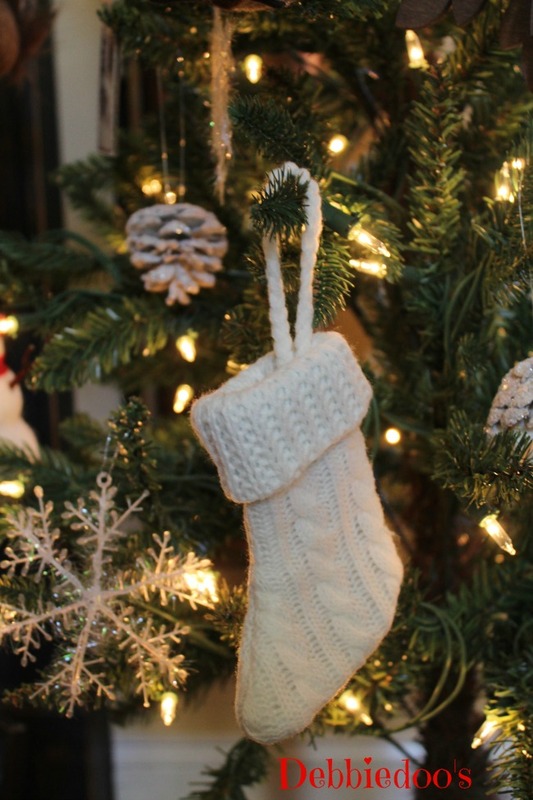 I love your tree….sometimes less is better!! And, your’s is too cute! 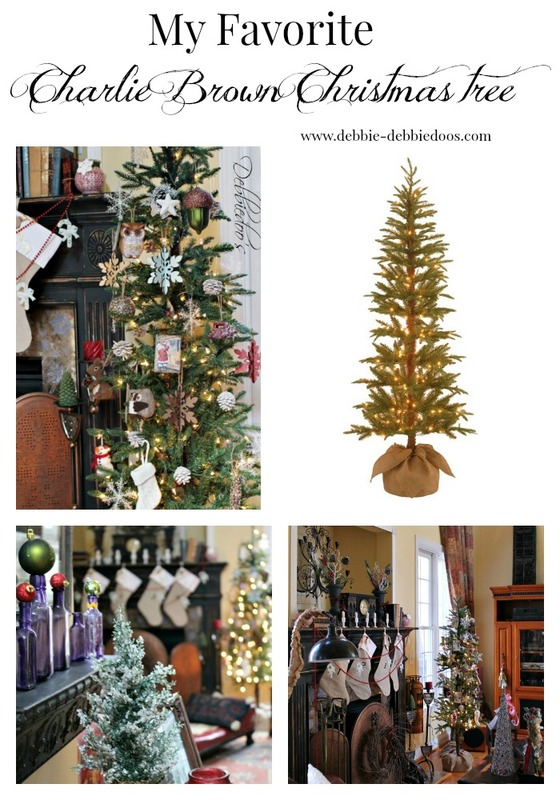 Loving your tree Debbie! I need that tree! I have such a small space to work with…..hmmm maybe I’ll get one on clearance this year for next year ??? Hi Deb, Love your tree. I bought a 4 foot tree at Target this year. Pre-lt, but we added more lights. No decorations on it yet. I have 2 bad ankles and I can’t be on my feet too long. Had to put ice on it for an hour, swelled up….You always do a fantastic job…..
That little tree packs a lot of wallop! Love it, Debbie! I love your Charlie Brown tree! The ornaments are adorable. I especially love the squirrel and the owl. I really thought you had made the owl…I know you could have. Who would have thought a Charlie Brown tree could look so amazing! 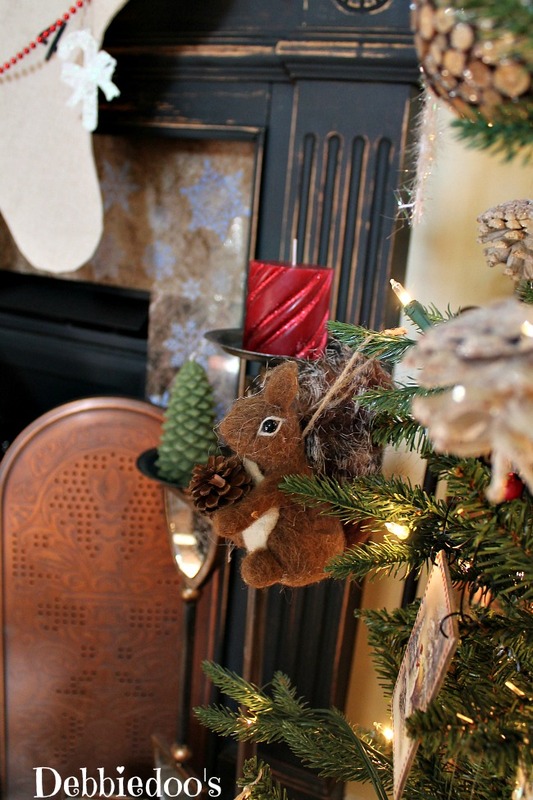 I love it, and I love all the little animals and other ornaments. It is adorable. I hope your shoulder doesn’t bother you too much over the holidays, try to take it easy on yourself, and hope it heals quickly. That’s a perfect Christmas tree & I don’t think it’s a Charlie Brown tree at all! I think it looks great & if it simplifies things for you this year, then why not? I didn’t know about your shoulder, Debbie. I hope you’re feeling better soon! Good grief, I see a trip to Target in my future! That is about the cutest tree I have seen. Perfect for my bedroom. Thanks for the head ups! Debbie, I think it’s so cute! 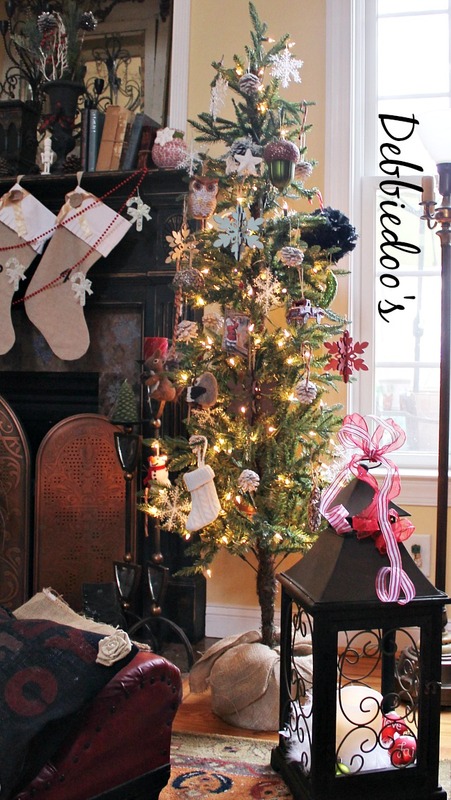 I did something similar….I put up a tabletop tree on an end table because we can’t sacrifice seating for a large tree any longer with company and the kids’ friends coming over at their ages. I love the Target tree. It’s the perfect style for your home! I’ve seen some Charlie Brown looking trees at Hobby Lobby.